I am feeling the lightness of decluttering. I confess that my “bite-size” approach to reorganization that I spoke loftily about in my last post became more of an enormous feast that offered course after course, each more tempting than the one before. The lazy days of summer, sipping ice tea and reading a good book, morphed into a greater adventure of looking back, remembering, reconnecting. Clearing away the “stuff” seemed to give greater significance to my “life events.” One thing that has become clear to me these past couple of months: our ability to accumulate is far greater than our capacity to de-accumulate. Perhaps it is because our “things” are connected to recollections of good times, festivities, achievements. They are the link to our past, and letting go is a sign of forgetting. In the first two or three decades of our lives, we are in the state of accumulating memories – graduations, weddings, births, careers etc. There is a sense of movement, of fresh opportunities. But in the last decades of our lives, we recognize the significance of passages and transitions. So it came as a surprise to me that “letting go” of stuff was the beginning of a new journey. Soren Kierkegaard believed that “Life can only be understood backwards; but it must be lived forwards.” When you have years to look back on, there is a great understanding how to live forward. I found that I best understood this when I came across my grandmother’s recipe for Æbleskiver (Ebbleskeever as spelled by my grandmother), found in a cookbook published by the women in her farming community who came together to share recipes. Æbleskiver, which means apple slices, is a traditional Danish pancakes that comes in the shape of a sphere. It is a pancake of sorts, but it has the lightness of a popover. There is a special pan, generally made out of case iron which allows the heat to penetrate the batter. I have heard that there are electrical pans, something that my grandmother would never have imagined. I have never made, Æbleskiver. Maybe it’s time I tried. Don’t know if I’ll ever make them, but love saying the name. Ah, this is where you have been posting recently – sorry I missed your posts Rebecca! 😦 I forget you have a collection of blogs, I thought I had a lot!! 🙂 I’m not in a good habit of thoroughly checking Gravatars these days, more keeping up with blog friend lists and new visiting friends. Gets difficult to manage it all after a number of years! I’ve been thinking for a while to piece together a post for the CuriosityShopp on small space living. Have been collecting bookmarks on various related subjects, and the video is soooo ideal. I shall feature that in the post! She lives in about the same space that I do, and also and old building too. In the next year I’m hoping to completely redecorate (with some valuable help! 😉 ) my entire little space, so that’s made me feel a lot more positive about it all now – thank you for thinking of that video for me, it was perfect! Good for you! You are on a quest to find an electric Aebelskiver pan–something special from your “heritage past”. I didn’t know one existed until I found out in a telephone call with my sister in Nebraska. I have had a cast iron one for years, but she says it is so easy to use an electric one–the heat is easier to regulate. It is interesting to me that I found a gentleman who lives in my senior hi-rise that has an ancient enamel pan with cracks in it. It was plain to see he was proud of it–he is totally Danish!! The cook book you have posted was part of a endeavor of the Tallin Ladies aid to record special items from their membership. I love that cookbook Ms. Frances! There are so many memories in every page and every recipe. 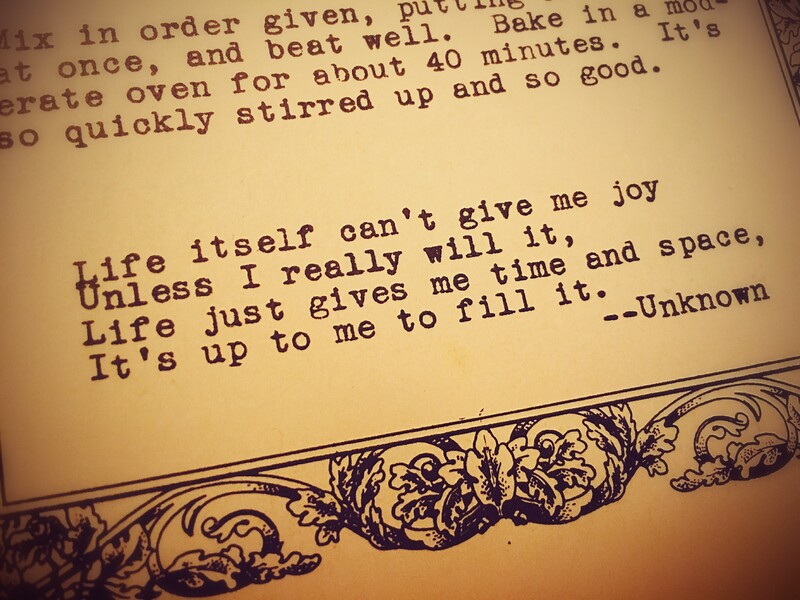 I especially like the quotes and sayings that go along with the recipes. This was a wonderful group of ladies who supported the community during good time and difficult moments. They knew how to celebrate life and the fellowship of friends. It does take strength to de-clutter – lots of it. We became on first name basis at the local charity shops, where we met other fellow de-clutterers. I wonder if we are experiencing a collective need to reduce, reuse, recycle. Consumerism has lost its appeal, replaced by a desire to collect experiences and friendships. I wish you the very best as you go forward. Spring and summer are the best time for this project. Keep me posted on your progress. Most of what is going out at the moment is simply rubbish; all those bills I kept for years (why?) and newspaper articles and programmes of concerts etc. The next sort may end up at the charity shop. A workman was here the other day. He said, “I guess you don’t watch much television.” I laughed. He was teasing me about my very old, very small TV. I have no desire for a bigger brighter version! It was delicious when my Grandmother made them. Now I’m on the hunt for a Aebeskiver pan! Will let you know when I found one that promises that even I can be a successful Aebeskiver maker. 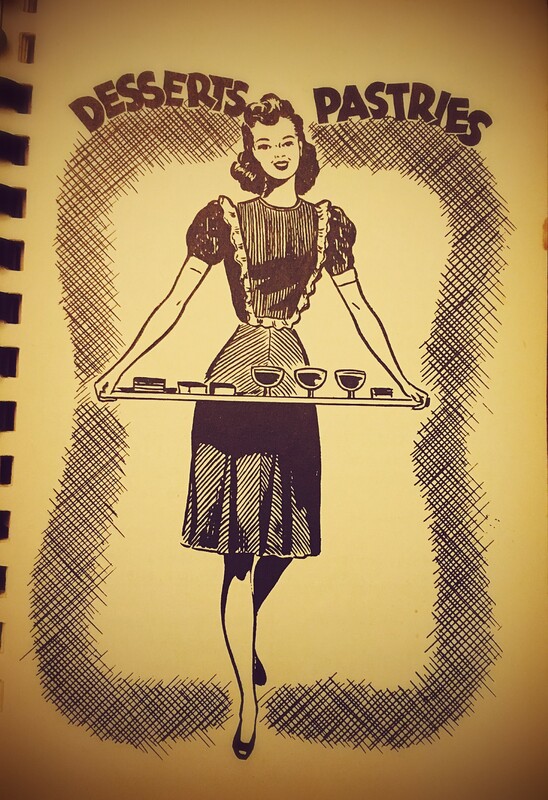 When I look at these old cookbooks (this dates from 1956) I realize that there was a lot more cooking and baking happening in the kitchens in those days. It also sounds like a great blog post!